Poster for the North American release. Tagline: "Now is the time for heroes." Football plays a central role of the film. A team of Allied prisoners of war (POWs), coached and led by English Captain John Colby (Michael Caine), a professional footballer for West Ham United before the war, agree to play an exhibition match against a German team, only to find themselves involved in a German propaganda stunt. Colby is the captain and essentially the manager of the team and thus chooses his squad of players. Another POW, US Army Capt. Robert Hatch (Sylvester Stallone), on enlisted TDY to the Canadian Army, is not initially chosen, but eventually nags the reluctant Colby into letting him on the team as the team's trainer, as Hatch needs to be with the team to facilitate his upcoming escape attempt. Colby's superior officers repeatedly try to convince Colby to use the match as an opportunity for an escape attempt, but Colby consistently refuses, fearing that such an attempt will only result in getting his players killed. Meanwhile, Hatch has been planning his unrelated escape attempt, and Colby's superiors agree to help him, if he in return agrees to journey to Paris, make contact with the French Resistance, and try to convince them to help the football team escape. Hatch succeeds in escaping the prison camp, travelling to Paris, and finding the Resistance; at first, the Resistance decides that the plan to help the football team escape is too risky, but once they realise the game will be at the Colombes Stadium they plan the escape using a tunnel from the Paris sewer system to the showers in the players' changing room. They convince Hatch to let himself be recaptured, so he can pass information along back to the leading British officers at the prison camp. Hatch is indeed recaptured, but upon his recapture, he is put in solitary confinement. Because he is in solitary confinement, the prisoners do not know whether the intended escape has actually been planned with the underground, so Colby tells the Germans that he needs Hatch on the team because Hatch is the backup goalkeeper and the starting goalkeeper has broken his arm. Colby actually has to break the existing goalkeeper's arm because the Germans want proof of his injury before they will agree to let Hatch onto the team. In the end, the POWs can leave the German camp only to play the match; they are to be imprisoned again following the match. The resistance's tunnellers break through to the showers in the dressing room at halftime, in an escape Hatch leads. But the rest of the team (led by Russell Osman saying "but we can win this") want to persuade him to carry on with the game, despite being behind 4-1 at halftime. Despite the match officials being heavily biased towards the Germans, and the German team causing several deliberate injuries to the Allied players, a draw is achieved after great performances from Luis Fernandez (portrayed by Pelé), Carlos Rey (portrayed by Osvaldo Ardiles) and Terry Brady (portrayed by Bobby Moore). Hatch plays goalkeeper, and makes excellent saves including one last save from a penalty kick as time expires to deny the Germans the win, drawing the game 4–4. An Allied goal had been blatantly disallowed earlier in the match, so, the POW team should have won, 5-4. The POWs do manage to escape at the end of the game following the original plan, amid the confusion caused by the crowd storming the field (shouting "victoire") after Hatch preserved the draw. Les Shannon, a former Burnley player, choreographed the actual game presented in the film. The film also credits Pelé as the designer of plays. World Cup winning goalkeeper Gordon Banks coached Sylvester Stallone. Stallone's character states that he is an enlisted member of the Canadian Army and a Maple Leaf shaped regimental badge can be seen on his beret throughout the film. The game was filmed in the Hidegkuti Nándor Stadium in Budapest, Hungary. In the film, Pelé plays a character from Trinidad and Tobago rather than his real-life native land of Brazil. While Brazil eventually joined the Allied cause and its soldiers fought against the Germans in the Italian theatre, their operations started too late in the war (mid-1944) for the presence of a Brazilian POW to be believable at the date of the film's events. The film is based on the 1962 Hungarian film drama Két félidő a pokolban ("Two half-times in Hell"), which was directed by Zoltán Fábri and won the critics' award at the 1962 Boston Cinema Festival. The film was inspired by the now discredited story of the so-called Death Match in which FC Dynamo Kyiv defeated German soldiers while Ukraine was occupied by German troops in the Second World War. According to myth, as a result of their victory, the Ukrainians were all shot. The true story is considerably more complex, as the team played a series of matches against German teams, emerging victorious in all of them, before any of them were sent to prison camps by the Gestapo. Only four players were documented as being killed by the Germans, and their deaths were long after the dates of the matches they had won. Escape to Victory featured a great many professional footballers as both the POW team and the German team. Many of the footballers came from the Ipswich Town squad, who were at the time one of the most successful teams in Europe. Despite not appearing on screen, English World Cup-winning goalkeeper Gordon Banks and Alan Thatcher was closely involved in the film, working with Sylvester Stallone on his goalkeeping scenes. Sports Illustrated magazine said "the game is marvelously photographed by Gerry Fisher, under second unit director Robert Riger." Nearly all of the film's music score borrows heavily from the first and last movements of Dmitri Shostakovich's Leningrad Symphony, particularly the march theme of the first movement, which is almost quoted verbatim, a practice which the composer Bill Conti would later employ in The Right Stuff with Tchaikovsky's Violin Concerto. Shostakovich's Symphony No. 7 has always been associated with secondary meanings within the music aimed at the Stalinist regime's overwhelming repression of individualism and freedom of expression, but at the time of its composition during the war was said to represent the oppression of Nazism. At the end of the film, the last part of Shostakovich's Symphony No. 5 is also used to signify the triumphant conclusion of the story. However, while the music may fulfil the final moments of Escape to Victory's exultant ending explicitly, it is believed Shostakovich wrote the ending to his symphony to imply forced rejoicing under an authoritarian force. In 2005, the Prometheus Records label issued a limited edition soundtrack album of Conti's score. ↑ Box Office Information for Escape to Victory. The Wrap. Retrieved April 5, 2013. 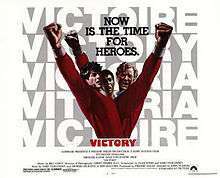 ↑ "Victory (1981)". Box Office Mojo. Retrieved 2011-07-23. ↑ " MovieVictory (1981)". The Numbers. Retrieved 2011-07-23. ↑ "12th Moscow International Film Festival (1981)". MIFF. Retrieved 2013-01-27. ↑ Child, Ben (23 March 2010). "Vinnie Jones keen for David Beckham to slip into Bobby Moore's shoes for an Escape to Victory remake". London: The Guardian. Retrieved 28 March 2011. ↑ "Dynamo: Andy Dougan: 9781841153193: Books". amazon.co.uk. Retrieved 3 April 2015. ↑ "Video". CNN. 10 August 1981. The Game of Death — Australian National Centre for History Education, concerning the events on which this film was based.